Gov. Andrew Cuomo was criticized Tuesday for vetoing legislation that would have authorized state pension credits for peacetime military service. 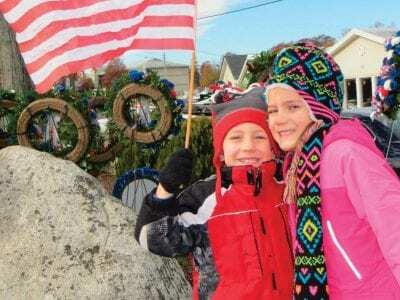 The legislation, authored by Sen. William Larkin of Orange County, a combat veteran of World War II, wo… Please login below or purchase a subscription to the Putnam County Courier to access this content. 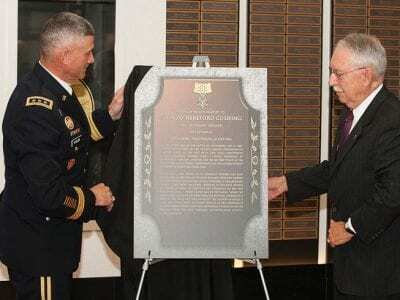 At right: Lt. General Robert L. Caslen and General Frederick M. Franks Jr. unveil a replica plaque honoring Cushing. On the eve of Veterans Day, the United States Military Academy honored a West Point graduate whose story embodies service and sacrifi… Please login below or purchase a subscription to the Putnam County Courier to access this content. 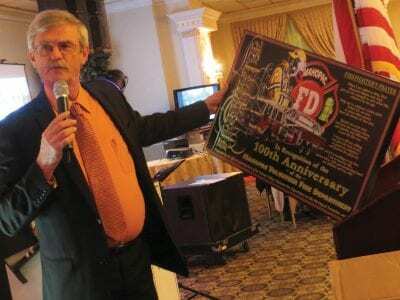 Putnam Valley FD Chief Ed McCarthy presents a hand made artist’s rendering to the MFD at its dinner and ball Saturday. The year-long Mahopac Fire Department’s 100th anniversary celebration has been a blast. From a gathering last winter at… Please login below or purchase a subscription to the Putnam County Courier to access this content. The Brewster School District has been commended by the State Comptroller’s Office for managing the district’s finances in superlative condition. A recent audit examined the school’s finances for the 2012-2013 school year that took into consideration… Please login below or purchase a subscription to the Putnam County Courier to access this content. Concerts Around the Corner is bringing the New York Philharmonic’s newest member for a performance at the Studio Around the Corner. The event is Sunday, November 23rd, at 3:00pm, when the Town of Southeast Cultural Arts Coalition presents Risi… Please login below or purchase a subscription to the Putnam County Courier to access this content. It’s all about vintage 1940s, “1944 D-Day” to be exact, at the Patterson Recreation Center when Swing N’ Patterson rolls around again on Saturday, Nov. 15. Performances by The Big Band Sound Orchestra will sweep and soar and … Please login below or purchase a subscription to the Putnam County Courier to access this content.